Platelet-rich plasma therapy (PRP therapy) is a new, cutting-age regenerative medical technology which holds potential to cure a wide range of musculoskeletal disorders. PRP therapy is a low risk procedure as it involves the use of patient’s own blood to deliver the treatment. 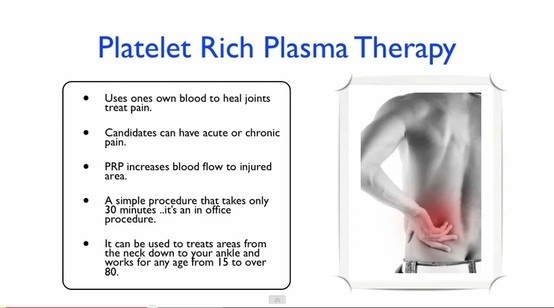 What is platelet rich plasma (PRP)? How is it prepared and used? PRP therapy can be performed in an outpatient department of a clinic or hospital. To generate PRP, blood is first extracted from the patient (about 30-60 ml) and is collected in a cen-trifuge tube. The tube is subjected to centrifugation for a defined period of time in a centrifuge machine. After two cycles of centrifugation, blood separates into three layers – the bottom layer composed of R.B.C’s and the middle layer (buffy coat) composed of W.B.C.’s and other debris. Both these layers are discarded. The third layer containing the platelets and growth factors is the layer of interest (platelet rich plasma layer). This is then injected into the target (injured) area in the patient’s body using a sterilized needle. The PRP has the inherent ability to attract stem cells to the target area in the patient’s body which encourages growth and repair of damaged tissues. Tendonitis: PRP therapy has been successful in treating cases of tendonitis like Golfer’s elbow and tennis elbow conditions. Other areas of damage like rotator cuff muscles and tendons of the shoulder joint, Achilles’ tendinitis, patellar tendonitis (Runner’s knees) can also be treated with PRP therapy. Ligament injury: Ligaments have poor vascular supply and hence consequent poor repair and regenerative capacity. So, injection of PRP into damaged ligaments like knee collateral ligaments, enhances the regenerative capacity of these tissues. Degenerative arthritis: Recently, PRP therapy has shown a marked improvement from osteoarthritic conditions. Knee, hip, ankle, shoulder and elbows joints are common victims of osteoarthritis. Treatment of these joints with PRP injections, have borne fruitful results. Spine disorders: PRP therapy can also be used to treat disorders involving the spinal canal like dege-nerative disc disease or facet arthritis. If you search the internet for platelet rich plasma therapy in Los Angeles, you will find that PRP therapy is growing in popularity. Even though few research studies have been performed on use of PRP in orthopaedic and pain management therapies, World Anti Doping agency, NBA, NFL and MLB (major sports teams) have accepted the efficacy of PRP therapy in treating sports related injuries. Famous sportsmen like Tiger Woods, Troy Polmalu and Hines Ward have successfully undergone PRP therapies and have benefitted from the procedures. As the blood used in PRP therapy belongs to the patients, there is no risk of rejection. Low risks of infection, bleeding or nerve injury may still remain. However, considerable pain in the target region may be experienced after a PRP procedure as the newly injected PRP triggers the immune response which is accompanied by pain and inflammation. This short-term pain is however bearable as it leads to long-term benefits of tissue repair and regeneration. If you live in Los Angeles and want to know more about PRP therapy, contact doctors or clinics practicing platelet rich plasma therapy in Los Angeles.